The listing of the 25 largest employers in Cambridge during 2018 is now available. Since the mid-1980s the Community Development Department (CDD) has collected employment data from Cambridge employers to assemble a list of the 25 largest providers of jobs. The information is updated annually and published on the web site with links to the career web pages of the listed organizations. The Top 25 list merits a closer look, as it provides insight into the overall economic climate in Cambridge. While measuring the city’s most significant employers, it is worth noting that the term “employee” can mean different things to different employers. To ensure a reliable basis for comparison across organizations, the Top 25 counts Full Time Equivalents (FTEs). A person working full time between 35 and 40 hours per week counts as one FTE (or one employee). Therefore, a person employed half time is 0.5 FTEs and a person working one full day a week is 0.2 FTEs (based on a 5 day work week). Over 55,000 full time equivalent positions are found across this range of employers, representing almost 43% of the Cambridge workforce reported by the Commonwealth of Massachusetts. The three largest employers in the city are Harvard University, the Massachusetts Institute of Technology, and the City of Cambridge. Eight of the top employers are pharmaceutical companies or research institutes engaged in biotechnology, drug development, or genetics research. These eight employers have over 12,600 employees. Some employers annually appear on the Top 25 list. Harvard University and MIT have shared the first two positions on every list since 1986; in all but two years, Harvard was the city’s largest employer. Lesley University regularly appears on the list, although further down in the ranking. The City of Cambridge generally ranks third, and Mt. Auburn Hospital and Draper Laboratories have also been listed every year since 1986. Looking beyond the “regulars,” the Top 25 reveals more. Over the years 64 different employers have appeared on the listing. Today, six of the sixteen private companies listed are in the biotechnology and pharmaceutical industry. Among them are Cambridge stalwarts such as Biogen, Novartis, Sanofi, Takeda Pharmaceuticals, and Pfizer. 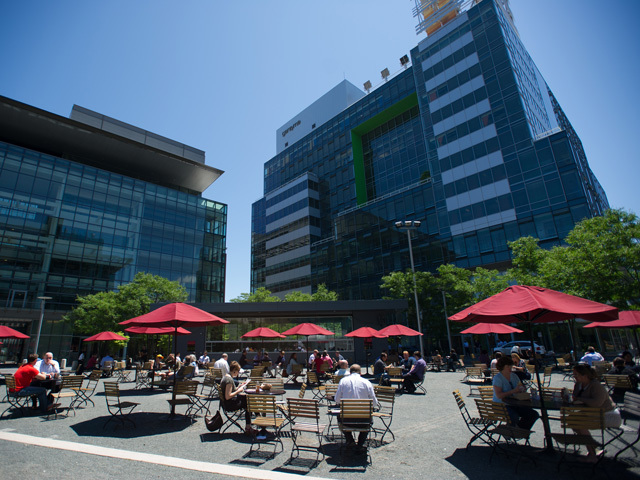 Adding those employers who otherwise support the biotechnology cluster—researchers at MIT, the Broad Institute and start-up support at the Cambridge Innovation Center (CIC)—ten of the Top 25 employers are involved in the biotech cluster. While Cambridge is known as a hotbed of internet and software innovation, much of that work occurs at smaller firms. Still, six of the Top 25 fall in this sector: Akamai Technologies, Hubspot, Google, IBM, Pegasystems, and CarGurus. The CIC also lends support to many internet startups. Finally, the Top 25 includes a diverse set of seven employers ranging from health care (Cambridge Health Alliance, Mt. Auburn Hospital) to consultants (Forrester Research) to research Institutes (Draper Laboratories, Broad Institute) and encompassing the educational services firm EF Education First and the Federal Government. The Top 25 list demonstrates the range, strength and capacity for economic growth in Cambridge, explaining the high level of confidence in its future. For more information please contact Cliff Cook. Senior Planning Information Manager, at 617/349-4656 or ccook@cambridgema.gov. Mon: 8:30 a.m. - 8:00 p.m.Tue - Thu: 8:30 a.m. - 5:00 p.m.Fri: 8:30 a.m. - 12:00 p.m. Include data about your current environment, like the browser and version. This helps us understand your feedback better. What additional information is included about my current environment?